I recently received a package from my friend in Ottawa. 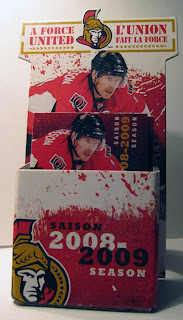 Along with a pile of Ottawa Senators game programs, various team pocket schedules and magnets, rally towels, ticket stubs etc, were two items I was most excited to receive... two Ottawa Senators 2008/09 pocket schedule holders. I love collecting pocket schedules, and pocket schedule holders are the ultimate item as far as I am concerned. Here is a photo of one of these prized items!